Omi Osun Joni L. Jones provides the first full-length study of an artistic form, the theatrical jazz aesthetic, that draws on the jazz principles of ensemble—the break, the bridge, and the blue note. Theatrical Jazz: Performance, Àṣẹ, and the Power of the Present Moment is a study of the use of jazz aesthetics in theatre as created by major practitioners of the form, giving particular attention to three innovative artists: Laurie Carlos, Daniel Alexander Jones, and Sharon Bridgforth. Theatrical Jazz examines how artists are made and how artists make art. 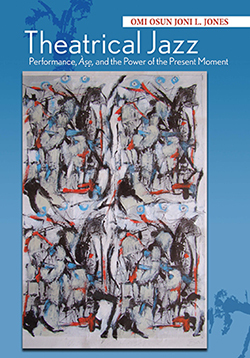 In charting their overlapping artistic genealogies, the book also discusses the work of veteran artists Aishah Rahman, Robbie McCauley, Sekou Sundiata, Ntozake Shange, and Erik Ehn, as well as the next generation of theatrical jazz innovators, Grisha Coleman, Walter Kitundu, Florinda Bryant, and Zell Miller III. Using autocritography as a primary methodology, the author draws on her role as performer, collaborator, audience/witness, and dramaturg in theatrical jazz, and her experiences with Yoruba spiritual traditions, to excavate the layers and nuances of this performance form. Jones’s use of performative writing, a blend of intellectual, artistic, and sensory experiences, allows scholars and students not only to read but also to “hear” the principles of theatrical jazz on the page. Omi Osun Joni L. Jones is associate professor of African and African diaspora studies at University of Texas at Austin.